SGPT: Tell us about yourself? Who is Mark James, endurance athlete? 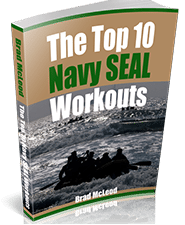 MJ: I was a college Cross Country (XC) coach for six years before getting hired by the Navy to be a civilian Navy SEAL Instructor in 2nd Phase at Basic Underwater Demolition School (BUD/S). I competed in XC and swam in high school despite moving around a lot as a kid and attending 3 high schools. I swam for a junior college a year before enlisting in the Navy in 1985. I had discovered triathlons that same year and was hooked after placing 10th at the Alcatraz Triathlon back before wetsuits were even permitted. In the Navy I became a SEAL ( Class 141). BUD/s was the most intense experience I’d ever had but having a sports background and overcoming adversity early on in my childhood definitely helped. While serving as a SEAL, I competed in triathlons and also made the USA Navy Pentathlon squad that competed in Argentina in 1989. The events included swimming with 2 foot long fins, obstacle course, rowing, lifesaving swim and an XC run with shooting. I left the service and Teams to become a Pro triathlete and attend college. I swam for UC Santa Cruz when I was 26 years old. I competed in the Hawaii Ironman 1991-2001. 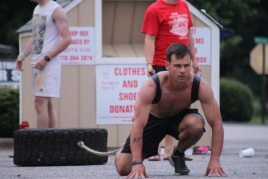 SGPT: How did you get started in Obstacle Course Racing (OCR)? 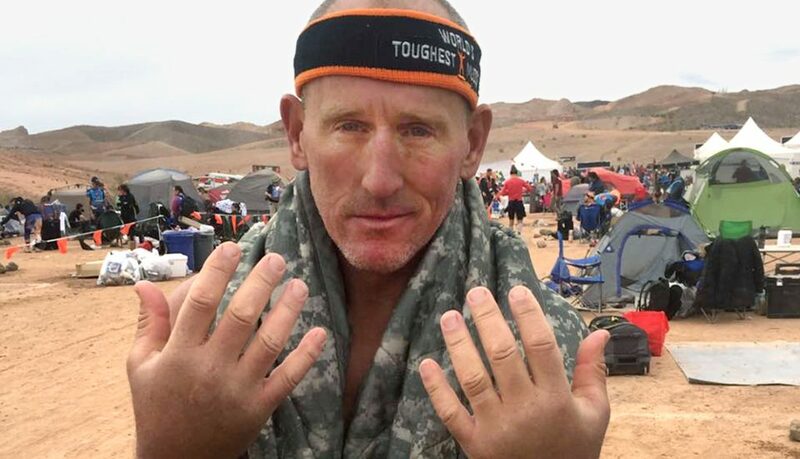 MJ: In 2015 I discovered OCR racing or specifically Tough Mudder racing. Then it was just a ten mile course. That changed last year to 8 hour events starting at midnight. I also tried my first 24 hour TM race in Nov 2016. I became an Ambassador for TM last year and have done 65 TM races. SGPT: What is an example of a workout that you have done in this past week to prepare for the upcoming race? Mark James: I used to advocate 3 specific workouts per week: fast interval running on a track or flat course, a long hour plus slower paced run on trails if possible and doing hill repeats. I fortunately have access to the obstacle Course at BUDs where I can do either as a full course or partition it. My favorite is ten obstacle courses in a row with subtracting one obstacle each time. I try and complete this set under an hour which is very hard in sand. I cross train by swimming in the ocean with fins, cycling both mountain and road and in 2019 I hope to do some XC skiing if I can find the time. I do have weights in my garage and do standard bench and barbel type sets. Additionally, I have an old lumber rack in my courtyard that I’ve used for pull ups and ring work. I climb on a bouldering/climbing set up we have at work and occasionally hike with a 25 to 40lb weight vest. SGPT: How are your rest days? How much sleep do you get a night? MJ: I started wearing a Garmin Fenix watch which monitors my sleep cycle. I try and go to sleep by 10 and am up to walk my dog at 6. If I’m lucky I’ll take a :30 nap in the afternoon whether it’s at home, on a couch at work or even on the floor. 8 hours is perfect. SGPT: What running shoes/trail shoes/boots are you wearing to train in? MJ: I received some shoes from Merrill who sponsor Tough Mudders bud I prefer ASICS especially the heavy weight Kayano model. I’ve bought used shoes on eBay before. It sounds gross, but the are greatly discounted and barely if even worn. When I run with the students I’ll wear Nike Freeze tan boots. Occasionally I’ll run on the beach barefoot which works my calves but if I go to far blisters up my toes. SGPT: Any supplements that you use? Stiff coffee? Protein? Etc? As I mentioned I enjoy coffee. 2-3 cups a day. I try not to put cream in it. I drink Emergency to make water not so dull and Ensure or chocolate milk. I’ll do a mega vitamin but rarely if ever any supplements which cost a lot. SEALgrinderPT is proud to donate funds to the Navy SEAL Foundation.